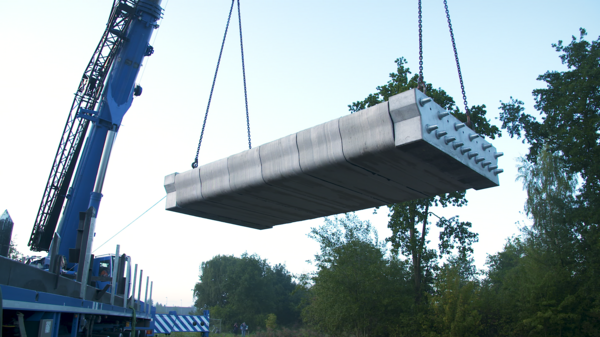 Today world’s first 3D printed reinforced, pre-stressed concrete bridge was opened. The cycle bridge is part of a new road around the village of Gemert, in the Netherlands. It was printed at Eindhoven University of Technology. With the knowledge the researchers gained in this project, they are now able to design even larger printed concrete structures. The bridge is the first civil infrastructure project to be realized with 3D-concrete printing. The bridge is 8 meters long (clear span 6.5 meters) and 3.5 meters wide. As it is a ‘worlds first’, the developers did not take any chances and tested the bridge by putting a load of 5 tons on it, which is a lot more than the load the bridge will actually carry. The bridge has to meet all regular requirements of course. It is designed to do its duty – to carry cyclists - for thirty years or more. With more cycles than people in the Netherlands, it is expected that hundreds of cyclists will ride over the printed bridge every day. It is part of a large road construction project, led by the company BAM Infra, and commissioned by the province of North-Brabant. An important detail is that the researchers at Eindhoven University of Technology have succeeded in developing a process to incorporate steel reinforcement cable while laying a strip of concrete. The steel cable is the equivalent of the reinforcement mesh used in conventional concrete. It handles the tensile stress because concrete cannot deal with tensile stress adequately, but steel can. One of the main advantages of printing concrete is that much less concrete is needed than in the conventional technique, in which a mold (formwork) is filled with concrete. By contrast, the printer deposits only the concrete where it is needed, which decreases the use of cement. This reduces CO2 emissions, as cement production has a very high carbon footprint. Another benefit lies in the freedom of form: the printer can make any desired shape, whereas conventional concrete shapes tend to be unwieldy in shape due to use of formwork. Concrete printing also enables a much higher realization speed. No formwork structures have to be built and dismantled, and reinforcement mesh does not have to be put in place separately. Overall, the researchers think the realization will eventually be roughly three times faster than conventional concrete techniques. With the knowledge gained, the Eindhoven university researchers are able to design and realize even larger structures. Their approach is to print elements that are assembled afterwards, as otherwise the maximum size of the structure would be limited by the size of the printer. The university is also participating in a project to print five houses, that are going to be occupied. The bridge is part of the Noord-Om project, a new section of ring road around the village of Gemert. The bridges’ elements were printed at Eindhoven University of Technology, which has a large concrete printer for R&D purposes. The project was led by the company BAM Infra, and it was commissioned by the province of North-Brabant. Others involved in the project are engineering firm Witteveen + Bos, the municipality of Gemert-Bakel, Saint-Gobain Weber Beamix B.V., Dywidag-Systems International BV, Verhoeven Timmerfabriek and NV Bekaert SA.